Chayote, chow chow or as known as Bengaluru katharikkai (brinjal) in tamil is one of those veggie which makes rare appearance at home. 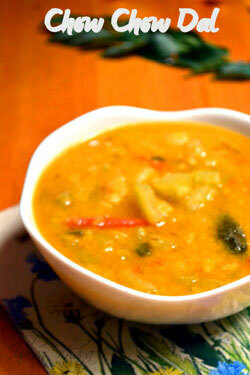 And most of the time I make this simple dal, though the recipe is easy but this dal taste very delicious. It's my sister recipe, I learnt this from her as in our parents place chow chow is total no-no, South Indian vegetables makes very rare appearance in my parents place. If you are in hurry or want something different then you should try this recipe, also it doesn't really require any side dish. Have it with roti or rice with papad and a little ghee always helps to enhance taste. Also you can check out my Chow Chow Chutney. 1. Wash, peel, de-seed and chop chow chow in medium size pieces. Slice green chilies and chop tomatoes. 2. Rinse toor dal, add chopped chow chow, water, turmeric powder and pressure cook for 3 whistles. 3. In a pan or wok heat oil/ghee add cumin seeds/jeera and allow to splutter, add minced garlic, green chilies, curry leaves and sauté until golden brown. 4. Add tomato and cook until it gets mash. 5. Add red chili and coriander seeds powders, mix well, cook for a minute. 6. Add cooked dal along with chow chow. 7. Add salt, water mix well and bring it to boil, off flame and add cilantro. Add little ghee on top if preferred and serve warm. Chow chow is my fav too..I like it in any form - curry/dal/chutney..
yummy dal, looks very flavorful. 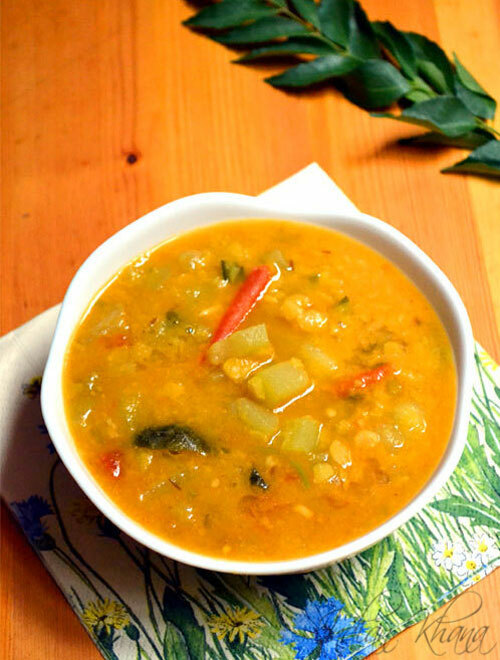 Delicious and healthy dal, I usually make stir fry with chow chow. 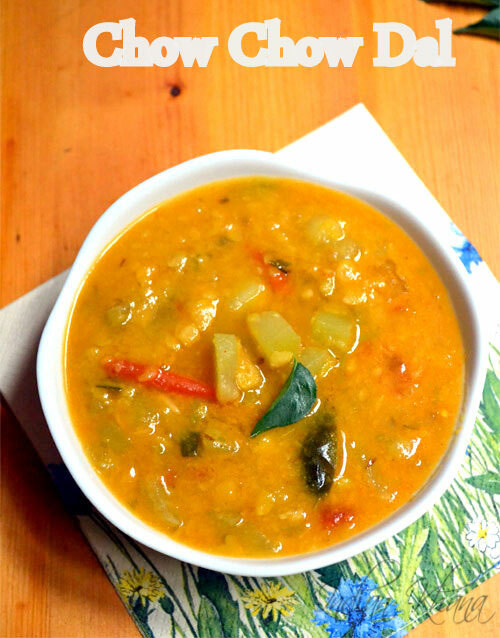 JUst love this flavourful dal,comforting food for me.